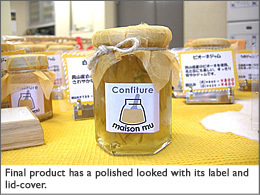 Confiture Maison Mu uses fresh and natural ingredients to make their fruit jams. All of the fruits that they use are bought directly from farmers, and are made into jam when they are most fresh. No preservatives or colorings are added. All jams are made by the head patissiere Ms. Shimamura alone. 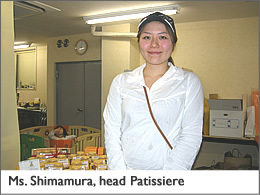 Ms. Shimamura graduated from a pastry school and then worked in a French pastry shop. Her turning point was when she received a large amount of organic plums from her friend, which she turned into plum jam. At first she was simply giving away her homemade jams. It was very popular among friends, so much that the pastry shop that Ms. Shimamura worked at decided to sell them at the shop. Creatively balancing out raw and white sugar, Ms. Shimamura's famous plum jam is still one of the most popular on her menu. 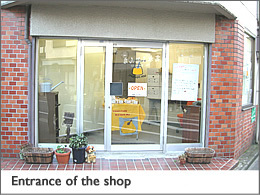 Ms. Shimamura became independent in 2008 and opened her shop Confiture Maison Mu in Kosuge, Tokyo. We got to observe the step-by-step procedure of how she makes her jam. On that particular day, she was making apple jam. 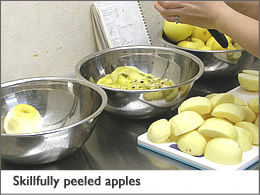 She used Shinano Gold, a class of apple that has a well-balanced flavor of both sweet and tart. She peeled off the skin, and cut the apples into bite-sized portions. Her pot filled up with apples very quickly. How much jam do you make on an average day? Generally, I make about s hundred bottles a day. I stick to doing only one kind of jam per day. It is very impressive how much work you do by yourself. I have to be creative in order to do everything by myself. 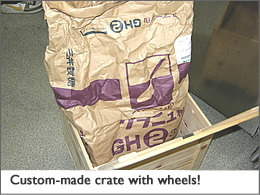 For example, a bag of sugar is very heavy so I put it in a custom-made crate with wheels so that it could be easily moved around. After putting the pot on the stove, juice exuded out of apples in just a matter of minutes. The apples soften gradually. Ms. Shimamura did not take a break from stirring it during the whole process. After boiling and stirring for about 30 minutes, sugar is added. 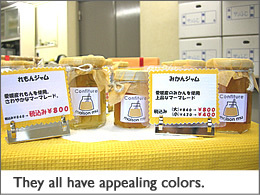 By this time the color of the apple jam has become more defined. So the sugar is added during the boiling process? For apple jams, I add sugar midway through the whole process. 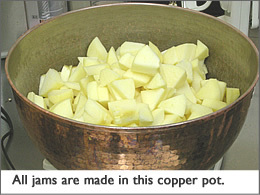 This is because apple jams can burn easily if sugar is added in the beginning. I monitor the timing that I add sugar according to fruits. 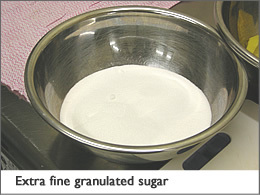 I use granulated sugar. I use a kind that is extra fine so that it dissolves easily when heated. Occasionally I would use raw sugar from Amami Oshima. After adding the sugar, the jam is left simmering for some more time. 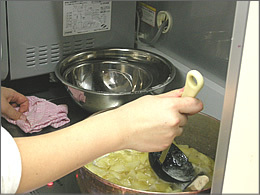 As Ms. Shimamura stirs the jam, we get a mouth-watering whiff of cooked apples. By this point, apples have become soft and started losing their shape. Any scum that floats to the top is removed as the jam approaches completion. 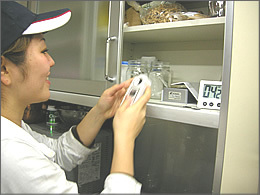 While still monitoring the contents of the pot, Ms. Shimamura pulls out her PAL. 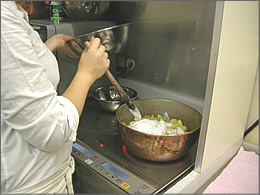 Using a wooden spoon, a dollop of jam is placed on the PAL sample stage. It read at 64.9% Brix. After checking that its brix value is at the desired level, jam is bottled up. This process is done carefully but swiftly. After sealing the lid tightly, the jam is now a finished product. We tasted the freshly made jam on a cracker. It still had a lot of tasty apple chunks, and though it read over 60% brix, it was not overwhelmingly sweet and had a natural flavor. Each kind of their jam has a tag line, and this one is called "spreadable apple pie." When I tried the jam it really tasted as if I was biting into an apple pie. So for this batch brix read at 64.9%. What is the general value that you aim for? For apple jams I aim for over 60%. 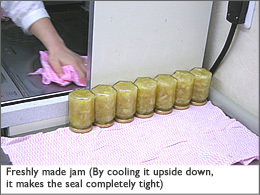 Target value changes between different kinds of jams. Those are pretty high readings. I focus on organic jams, so I don't add any synthesized preservatives. Since sugar is a natural preservative, it is important that I add enough of it. When do you take measurements? When it looks and feels done, I check with PAL. I can also measure Brix mid-process to see how much longer I need to simmer down jams. 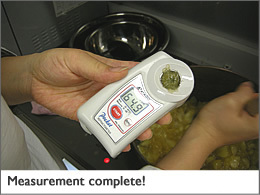 The timing that I take measurements at also changes according to each kind of fruits. So for today's apple jam, you used PAL to check if the product was ready? Yes. For jams with less water, I tend to take measurements near the end. For jams with high water content, I measure midway through the process to determine when to add sugar. I guess the procedure really changes from fruits to fruits. Yes. I take into account different characteristics of each fruits and come up with the best method for each. Because I only use fruits in season, I can only process one kind of fruit once a year. Therefore, for consistency, I take good notes of procedures and Brix value for each batch. What do you like about making jam? It makes me very happy when the final product reflects its naturally vivid colors of the fruits. I don't use any food coloring, so I am always very careful not to caramelize them too much. When I use raw sugar as a sweetener it sometimes reflects some of the color from the sugar, but most of the time I try to maximize the color of the fruits. So I guess the key is the simmering time. Yes it's very important. I try not to rely only on sensory evaluation but rather use a refractometer to make sure the sweetness has become satisfactory. That's how I can control and minimize simmering time. Where did you learn to make jam? I mostly taught myself. The very first time I made jam I looked the process up on the Internet. I also take notes from famous jam makers' recopies, such as Christine Ferber's; Ms. Ferber is a world-famous patissiere who is known for her delicious jams and jellies. What are the challenges of jam making? It can get overwhelming when a lot of fruits get delivered at the same time. I want to make jam when fruits are at its freshest, so I can't let it sit for too long. Because I work by myself, when I really can't get to all the fruits immediately, I do some prep work on it so it can be preserved for few days. When you say big delivery, how much exactly are you talking about? It could be as much as 100kg. I can only cook about 4kg per batch in my pot, so sometimes I am up until midnight just cooking jams. Yes, when it's hard like that, I try not to think about it too much and finish what I need to do, one by one! Today we had the opportunity to watch Ms. Shimamura as she goes through her whole jam-making routine. We couldn't help but notice how she works so efficiently and gracefully. During our visit, we had another guest observing Ms. Shimamura. Her daughter seemed to really enjoy watching her mother make jam. Ms. Shimamura had a bright smile on her face every time she talked to her daughter.